PITTARC Welding Wires - SIAT S.p.A.
PITTARC has anticipated the most stringent market requirements and has recently started a new line for the production of wires to be used in the most challenging applications. This new product line is called INNOV-ARC. INNOV-ARC wires were submitted to operational tests at the laboratories of the Italian Welding Institute, whose instructors were very favourably impressed by their results. This surface treatment can be applied to any type of wire, regardless of its chemical composition, diameter and packaging. Do you want to make welding more comfortable? Come to visit us at our stand and we will give you a handy buff. 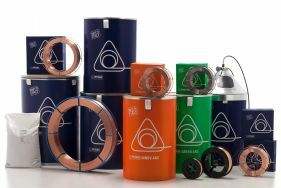 The Pittarc’s production range includes a wide range of gas shielded and submerged arc welding wires. PITTARC welding wires are CE certified, fulfill the requirements of EN 13479:2004 and are approved by the major Certification Institutes: RINA, TÜV, DB, LRS, DNV GL, ABS, BV, etc. PITTARC GMAW wires are manufactured from low impurity and gas content wire rods to obtain welded beads with excellent mechanical characteristics and toughness at low temperatures. The range of products available is suitable for welding of carbon and low alloy steels and can be used in a broad range of applications such as medium and heavy steelframes, earthmovers, automotive sector, agriculture, tanks, etc. GMAW welding wires are manufactured with diameters from 0.6 mm to 1.6 mm and are available in various packaging solutions, such as plastic and steel spools from 5 to 18 kg and drums from 250 kg. All wires are available as standard copper coating, copper – free (GREEN – ARC) and high performance (INNOV – ARC) the latter being the result of PITTARC’s commitment to environmental protection, technological innovation and continuous improvement of its processes. PITTARC’s SAW wires are produced with innovative equipment and process technology, developed by PITTARC in house. We produce more than 20 different grades of SAW welding wires suitable for joining carbon and low alloyed steels and can be used in a wide range of applications such in the oil and gas sector, SAW Pipe mills, offshore applications, pressure vessels, wind towers, heavy frameworks, etc. The SAW wires are available in the diameter range from 1,2 mm. to 5,0 mm and are available in different packaging solutions from 25 kg. up to over 1.000 kg. SIAT SpA has been operating for more than 40 years in the field of submerged arc and gas shielded arc welding wires under the PITTARC trademark. Its synergies with other companies belonging to the Pittini Group have led to the development of latest generation technology and plants for manufacturing high quality products that can meet all market demands, also in the most challenging applications. Manufacturing processes are permanently controlled in each processing step, from production of raw materials (rods) to finished products.